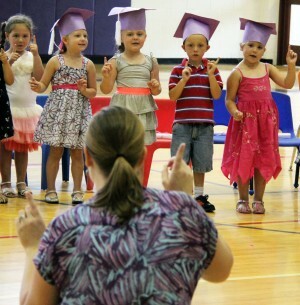 The Fairley Elementary School gymnasium was filled to capacity Wednesday morning amid much pomp and circumstance for pre-kindergarten graduation. Mariah Miner smiles from ear to ear as her parents, Lindsey and Gary Miner, congratulate her on graduating from the Hannibal Central School District’s pre-kindergarten program on Wednesday morning. 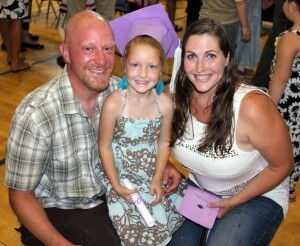 Sixty-four pre-k students earned their diplomas after a year of hard work and dedication in the classroom. Decked out in caps made of purple construction paper, they sang songs and put on a performance for their family members in the audience. Fairley Elementary School pre-k students follow their teacher’s lead as they sing and dance during their graduation ceremony Wednesday morning.